Today marks the one year anniversary of the tragic disaster at SCOAN that claimed 116 lives. One of the many excuses TB Joshua gave for not fulfilling his civic duty of appearing in court when summoned was that he was the “chief mourner” and was too busy tending to the needs to the families. As the “chief mourner” you would think he would be eager to be present for the one year remembrance service wouldn’t you? Not only was he not present, he didn’t even personally deliver his address, it was read out by ex-wiseman Racine. You can listen to the address in this video or read it on facebook. Wiseman Racine claims that TB Joshua would have loved to have been there in person, but due to security concerns he could not be. This seems an unlikely excuse, but even if this was the case, couldn’t he have done a live video/phone linkup like he used to do when he had international branches? Or at the very least he could have pre-recorded himself personally delivering the message instead of getting a minion to read it out. Of course we know the real reason he wasn’t there, in person or on camera is that he’s not even on the African continent right now, but he doesn’t want anyone to know. Shortly after the building collapse he announced that he would be visiting South Africa every week in memory of the “martyrs”, and that this instruction was a “revelation from God” (7:10 and 9:04 in this video). Since this statement TB Joshua has not visited South Africa once (at least not in the capacity he described), not even for the one year remembrance service. Why was he disobedient to God’s command? Why did he lie to the victims families? Meanwhile Kirsten Nematandani, SCOAN’s spokesman in South Africa (with his own shady past) has insisted that “The truth will come out one day, that’s what the man of God has said. Government will go deep into the matter because surely there are answers that are left hanging. Time shall tell.” (source). We’ve got news for you Kirsten, the truth came out back in July, everyone outside of SCOAN supporters know exactly what caused the collapse, the only answer left hanging is when the government are going to take action. Here we have lie upon lie, coverup upon coverup. To those in SCOAN who know the deception that’s going on and are being used as pawns in this game, when are you going to wake up and remember the 9th commandment – do not bear false witness? Whatever you think you’ve seen or think you’re involved with, don’t let that distort and erode your God given moral compass. Lies come from the father of all lies, so as those who claim to follow “the way, the truth and the life”, it is your responsibility to be instruments of truth, exposing lies and deception. Where have the wisemen gone? All but one of the SCOAN international branches have closed, healing services are cancelled indefinitely, allegations of criminal negligence are flying around, TB Joshua has been nowhere to be seen for more than 3 months (thought to be lying low in Mexico), Sunday service attendance has plummeted and now the latest development: the wisemen are gone. Wiseman Harry is now permenantly back in Greece heading up the unannounced SCOAN Thesselonica, the other wisemen have not been seen at SCOAN for weeks* and now their presence has been scrubbed from the website (see above). In the same way an international branch will be dropped quietly as if it never existed in the first place, or a loyal overseas evangelist will be suddenly disowned, now it would appear the same has happened to the much lauded spiritual “sons” of TB Joshua. Our friend Joshua Debunker on youtube saw this coming a while back, if you’re looking for a new prophet now TB Joshua is off the scene, Debunker is your man! *UPDATE: Some readers have pointed out that one or two wisemen have been seen in the background on Emmanuel TV more recently than we thought, so it appears some of them remain at SCOAN, but very much in supporting roles. Let’s not forget, SCOAN once claimed that the wisemen were five four men who had received Divine anointing, used by God to prophesy, heal and deliver people. What happened to that “anointing”? 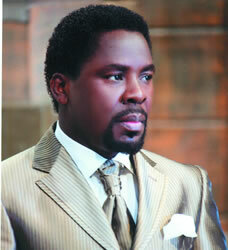 TB Joshua has not appeared at SCOAN Lagos since the 3rd May and no explanation has been given by SCOAN. Sunday services are visibly depleted with no overflow congregation and little to no use of the balconies. Various news sources have reported the devastating effect his absence has had on the economy of the area around SCOAN HQ. Even pro-TB Joshua sources are showing signs of confusion. TB Joshua Fans UK and TB Joshua sponsored “reporters” Ihechukwu Njoku and Nosa Osazuwa have all published articles on the matter, acknowledging the drop in numbers but not showing any signs that they know the whereabouts of the runaway prophet. Over a month ago we exclusively revealed that TB Joshua had not left Mexico after his crusade, remaining in Latin America to wait out the results of the court case, out of the reach of Nigerian authorities. Since then we’ve not seen any evidence that he’s returned, although we have not been able to confirm one way or another. You could be forgiven for wondering why TB Joshua is still in hiding when it seems likely that he will only get a slap on the wrist and a $1250 fine. The problem he faces is that as an infallible man of God, the messiah of our time, Jesus of our generation and the one sent by God as a sign of his love for humankind, he can’t be seen to be making mistakes, let alone mistakes that led to the deaths of 116 people, accusations of criminal negligence and worldwide news coverage. That’s why SCOAN are so determined not to accept the coroners conclusion even if it does only come with a $1250 fine, paying that fine would be an admission of fault. That’s why SCOAN supporters are desperately grasping at straws trying to find alternative explanations for the building collapse to the litany of structural failings revealed in the coroner’s report. That’s why TB Joshua is unlikely to come out of hiding to face the music anytime soon. Messiah’s don’t make mistakes. In the meantime, we’ve not heard anything credible or conclusive since the Mexico revelation, but various rumours abound. A keen viewer of Emmanuel TV noticed that some of his close confidants who were also missing since Mexico have recently returned to Lagos, does that mean he has too? Others have heard rumours that he is covertly setting up a new ministry and that SCOAN would be abandoned. Then there was the (slightly dubious) news article that claimed he was moving SCOAN HQ to Ondo in his home state, possibly leaving Lagos as a branch, or closing it altogether. You have spent many of your best years sincerely believing that you were serving God under the mentor-ship of a great man of God, you have made uncountable sacrifices for the sake of this ministry. You have no doubt become so conditioned to the frequent lies, deception and misdirection employed by SCOAN that you hardly notice it. Hopefully this current haze of confusion about the future of SCOAN will awaken you to the fact that TB Joshua is not a pious man of God being persecuted, but a criminal escaping justice and refusing to take responsibility for his actions. There is no doubt about it, TB Joshua is going down. Whether he ends up being incarcerated remains to be seen, but his name is forever tarnished with the blood of 116 people who made huge sacrifices to visit him hoping for a miracle, but instead returned in coffins. The time to get out is now, SCOAN is crumbling, the longer you stay the more painful the exit will be. There are friends and family that long to see you, you will be welcomed with open arms. If money for air tickets is a problem, get in contact, there are people who can provide. If access to your passport is a problem, you only need to get to your nearest embassy for help. It has hardly gone unnoticed that TB Joshua has not appeared in public since his Mexico crusade. Prayer line services have been cancelled, church “evangelists” have been left with the task of preaching and ministering, and his birthday was inexplicably moved from Lagos to South Africa, without the birthday boy in attendance. The inquest into the deadly building collapse at SCOAN will deliver its verdict on the 8th July. As you will recall, TB Joshua has been totally uncooperative with the inquest, refusing multiple times to show up as a witness. The evidence that has been released to the public so far does not go in SCOAN’s favour, and with a new government in place less sympathetic to TB Joshua’s cause, he could be facing very serious consequences. Previously we speculated that he may have retired to South Africa to escape the law, but that didn’t quite make sense to us. South Africa has an extradition treaty with Nigeria, a far more robust legal system, and will be taking the verdict of the inquest very seriously, because the majority of the victims were South Africans. So we kept digging, and what we found out was shocking. TB Joshua never returned from Mexico! We have been following several threads of evidence that have suggested this, but now have confirmation from a trusted inside source that TB Joshua is, quote “still in Mexico, hiding from the law”. Mexico offers 6 month tourist visas, more than enough to see what the inquest verdict is and plan his next move. Video message from TB Joshua in his “office” or somewhere that can’t be verified as SCOAN HQ in Lagos. Hoards of commenters sent by SCOAN to claim that they’ve seen him in Lagos, and we’re making all this up. Undated pictures of him in Lagos or on prayer mountain presented as if they are current. Social media post denying the claims, but without any evidence. If you were planning on spending your hard earned money to visit Lagos in the hope of seeing TB Joshua, cancel your plans now, he won’t be there!